Today I thought I would share the first, of an on going series with you all. We have a friend who has a camper that literally sits on the edge of Lake Ontario near Sodus Point, NY. Eric and I try to go there at least once per month in the Summer and the Fall (It is way to cold in the Spring because the lake is still so cold!) I will show you what we cook when we are at the camper. It is totally NOT roughing it, as it has a shower, bathroom, Queen size bed, mini kitchen, etc. We almost never cook in the kitchen because we love cooking over the open fire. Today I will share a super easy Grilled Salmon with Pesto that can be finished in less than 15 minutes. Glamping has become a very popular term lately. I even saw a story regarding glamping on the news, a few weeks ago. Although we didn’t call it glamping, we have actually been doing it for years! The key to Glamping, or camping, for that matter is preparation. You have to think of every detail. Usually the places we go glamping are a bit remote, so that even if there is a store within driving distance, you know they will charge an arm and a leg for a forgotten ingredient! So make your list and check it twice! Trying my hand at bird shots! This is the pesto I made with my plethora of garlic scapes, find the recipe here. I freeze the pesto and then it is perfect for our glamping because it stays nice and cold for a while on ice. All you will need to do is season the fish with salt and pepper. Spread a generous amount of pesto on salmon. Now, you can use any pesto that you like for this salmon, this Garlic Scape Pesto is just awesome with the salmon! We cooked one on a cedar plank which gives the salmon a delicious smoky flavor. We cooked another on lemon slices which added such a glorious lemony kick to the pungent garlic scape pesto! Also pictured are red potatoes wrapped in foil and broccoli steaming inside foil tent. I hope you enjoyed my first recipe for our version of “glamping”, series! The accomodations may not be that glamorous but the food always is! Soon to follow with some more episodes! If you give this Grilled Salmon with Pesto a try, let me know how you like it in the comments below! Don’t forget to sign up to my mailing list so that you don’t miss a recipe! This Salmon with Pesto is made with my Garlic Scape Pesto! It is a great, quick dinner for your Glamping or Camping, or even just in your back yard on the grill! Bring salmon to room temperature while your fire is heating up. Rub both sides of fillets with olive oil. Then season with salt and pepper. Spoon a generous amount of garlic scape pesto on top of each filet. If using cedar plank, char one side of plank and turn over. Place salmon filet on the charred side and cook for about 10-12 minutes, depending on thickness of filet. Internal temperature should be 145°F according to USDA. We cook ours to 120-125° for medium to medium rare. 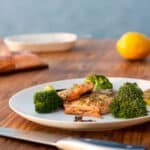 I am a sucker for anything with pesto, and this salmon looks great! Thank you Jessica! I am like you, I love pesto on so many things! Cooking over an open fire is always going to be better, be more fun and taste great. I hope you had a wonderful time. Thank you Jacqueline! We did! It is so relaxing on the lake. No cell phone service, or internet! Perfect! I love Salmon its my favorite seafood other than lobster. Its so healthy for us. I really love this pesto and that is it grilled a bigger bonus! Me too! I could totally eat it seven nights per week! Thanks so much for your comment, Claudia! Your bird photography looks pretty darn good and so does this salmon! We eat a lot of salmon so I’ve gotta try this recipe next time. Thank you Shashi! Kind of just playing around! I saw bald eagles and an osprey too, but couldn’t get a decent shot! Next time I hope! Totally one of my favorite recipe ideas! 2 of my favorites! Me too! I love anything salmon and this garlic scape pesto is to die for!! Thanks Heidy! Salmon and your garlic scape pesto are just an awesome combo for glamping! Love the camper too, it is my dream to rent a camper and visit USA from east to west! Oh! Wouldn’t that be fun! You had better stop in and have a glass of vino on the veranda with us! Thank you Patty! I love how simple and healthy this salmon is without sacrificing flavor. I would have never thought to make this camping, but I think this is a brilliant idea. I always stick with the more traditional things like burgers and hotdogs. I like this idea better. The garlic scape pesto sounds amazing also. Thanks so much, Katie! We always liked to splurge a bit on camping trips to make the experience a bit more special! The pesto is fantastic! As I’m writing this comment we are waiting on our taxi to take us to the airport for a trip to Canada with a camper. I’m taking recipe along with me and will try it when we can find good salmon there. That will not be a problem in Canada 🙂. Thanks for sharing. Oh how fun! I hope you enjoy it! Canada is so beautiful! Have a wonderful trip! Let me know how you like the salmon! Thank you Julie! It is so nice cooked over the wood fire! Not only does that look like you had a fun time, your meal looks fantastic. I love salmon and the pest looks so delicious!!! Thank you Elaine! It was very relaxing and peaceful! And the food was awesome! Mmmn, salmon and pesto is a great flavor combo. Everything tastes so good when cooked over fire glamping doesn’t it? A great recipe to take camping. Awesome bird shots too. They’re tricky to catch in focus. Thanks so much, Michelle! Yes, I probably took 3 hundred bird shots and come away enough to fit in one hand, lol! We love cooking on fire as well!